Hosts Dooks will face Malahide for the Irish Mixed Foursomes title in Friday's All Ireland final. The Co Kerry club beat Castlerea 3½ - 1½ with Malahide seeing off Ballyclare 3-2 with victories for Paul O’Connor and Orla McMahon and Gavin O’Connor and Rosemary Cassin in the last two matches. Ireland's quintet of recently selected Walker Cup players gathered at Portmarnock on Wednesday for a friendly game where they were joined by GUI National Coach Neil Manchip, world No 22 Shane Lowry and Challenge Tour player Ruadhri McGee ahead of next week's matches at Royal Lytham and St Annes. Castlecomer beat Portumna 3.5-1.5 and will face Waterford Castle in Friday's final of the Spanish Tourist Board sponsored Irish Mixed Foursomes at Warrenpoint. Dooks Golf Club filled a 126-year void on Saturday when they captured the Irish Mixed Foursomes Munster title on their home course — the first Cups and Shields pennant in the club's 126-year history. 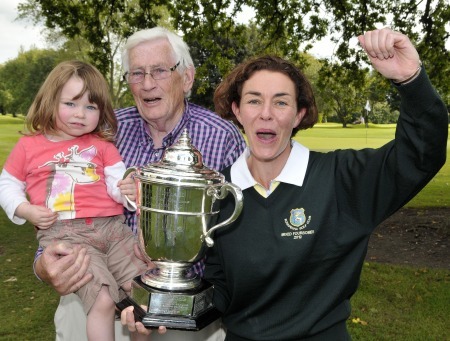 Orla Lenny celebrates with her father Seamus Mallon and daughter Lara following Rosapenna’s Irish Mixed Foursomes victory at Clontarf. Picture by Pat CashmanRosapenna claimed the first national title in the club’s 119-year history with a dramatic victory over Dromoland in the Spanish Tourist Board sponsored All-Ireland Mixed Foursomes at Clontarf. Good things come to those who wait and so it proved for historic Dooks who capture the first All Ireland pennant in the club's 127 year history with a. 3.5 - 1.5 win over Malahide in the Final of the Irish Mixed Foursomes on home turf.